“…The first Masonic funeral that ever took place in California occurred in the year 1849, and was performed over the body of a brother found drowned in the bay of San Francisco. On the body of the deceased was found a silver mark of a Mark Master, upon which were the initials of his name. A little further investigation revealed to the beholders the most singular exhibition of Masonic emblems that were ever drawn by the ingenuity of man upon the human skin. 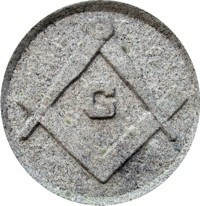 There is nothing in the history or tradition of Masonry equal to it. Beautifully dotted on his left arm, in red and blue, which time could not efface, appeared all the emblems of Entered Apprentice. There were the Holy Bible, the Square, and the Compass, the twenty-four inch gauge, and the common gavel. There were also the Mosaic pavement, representing the ground floor of King Solomon’s Temple, the identical tassel which surrounds it, and the blazing star in the center. On his right arm, artistically executed as the others, were emblems pertaining to the Fellow Craft, the plumb, the Square, and the level. There were also the five columns, representing the five Orders of Architecture — the Tuscan, Doric, Ionic, Corinthian, and Composite. In removing his garments from his body, the trowel presented itself, with all the tools of operative Masonry, besides all the emblems pertaining to the degree of a Master Mason. Conspicuously on his breast were the Lights of Masonry. Over his heart was the Pot of Incense. On the other parts of his body were the bee-hive, the book of constitutions, guarded by the Tyler’s Sword; the Sword pointing to a naked heart; the all-seeing eye; the anchor and ark; the hour-glass; the forty-seventh problem of Euclid; the sun, moon, stars, and comet; the three steps, emblematically of youth, manhood and old age. Admirably executed was the weeping virgin, reclining on a broken column, upon which lay the book of the constitutions. In her left hand she held the Pot of Incense-emblem of a pure heart — and in her uplifted hand a sprig of acacia — the emblem of the immortality of the Soul. Immediately, beneath her stood winged Time, with his scythe by his side-which cuts the brittle thread of life-and the hour-glass at his feet-which is ever reminding, us that our lives are withering away. The withered and attenuated fingers of the destroyer were delicately placed amid the long and gracefully flowing ringlets of the disconsolate woman. Thus were the striking emblems of mortality and immortality beautifully blended in one pictorial representation. 1849 I forgot what year the Masonic Cemetery was established in San Francisco. I wonder if it was in that Old Cemetery near City Hall and the James Lick Pioneer Memorial. It might have been in the Masonic Cemetery – Behind USF and Saint Ignatius Church near Northeast Corner of Golden Gate Park ! The remains might have been relocated to Woodlawn Cemetery in Colma where many of the Masons were re-interred in a mass grave.